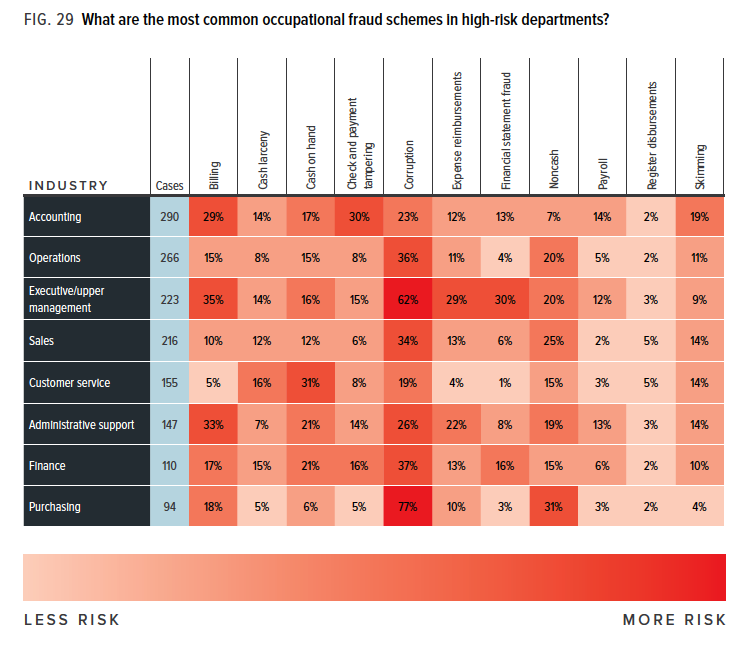 The latest Report to the Nations: 2018 Global Study on Occupational Fraud and Abuse from the Association of Certified Fraud Examiners is full of interesting data about who commits fraud and why; which industries are most likely to fall victim to fraud; and the most effective controls. Fortunately, you don’t have to read the 80-page report, because we’ve compiled some of the most interesting findings and infographics from the report for you. 1. Fewer fraud cases are being reported to authorities than a decade ago. 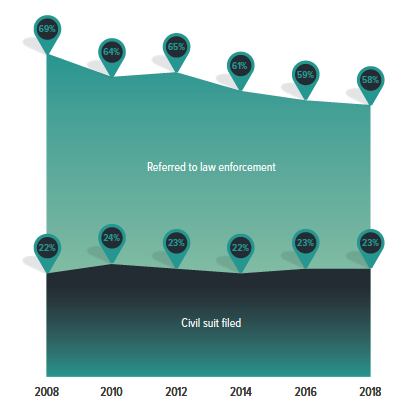 Overall, only 58% of occupational fraud cases were referred to law enforcement between January 2016 and October 2017, an 11% drop since 2008. 2. 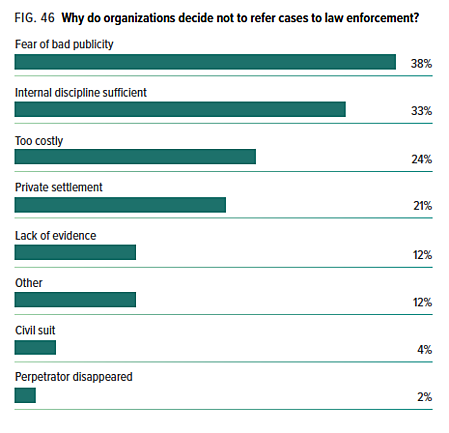 Top reasons cited for failing to report fraud to authorities: 1) fear of bad publicity (38%) 2) internal discipline was considered sufficient (33%), and 3) concern that it would be too costly (24%). Unfortunately, if cases aren’t brought to the attention of police, fraudsters can “move on to other employers and repeat their crimes,” said John Warren, J.D., CFE, vice president and general counsel of ACFE and one of the report’s co-authors. 3. Nearly half of frauds involved Internal control weaknesses. 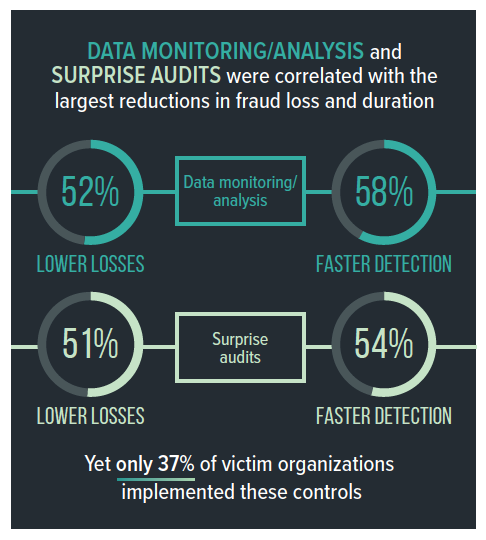 In 30% of cases, companies lacked simple controls, while another 19% of fraud occurred because the perpetrator was able to override the controls that businesses had put in place. 4. 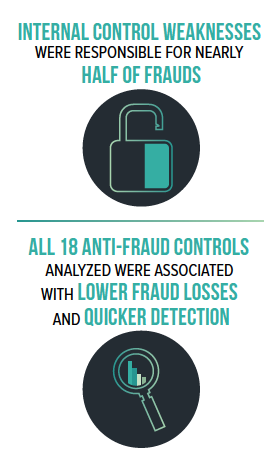 Most effective anti-fraud controls: Proactive data monitoring and analysis was the most useful and effective at reducing fraud duration, resulting in 58% faster detection. Only the presence of a company code of conduct was a more effective control for reducing fraud losses (56%), compared to data monitoring and analysis (52%). Unfortunately, only 37% of organizations surveyed had proactive data monitoring and analysis controls, compared to 80% with a code of conduct. This finding demonstrates how proactive data monitoring and analytics solutions like Oversight Insights On Demand® can speed fraud detection while reducing financial losses. 5. 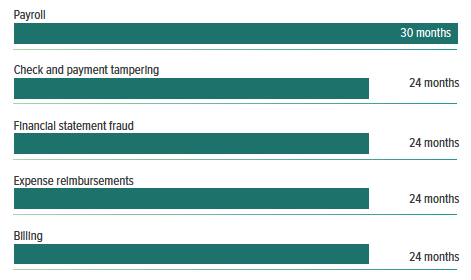 More overall fraud cases were reported in these industries: Banking and financial services, manufacturing, and government and public administration. 6. Expense report fraud schemes were most common in these industries: #1: Professional Services; #2: Religious, charitable, or social services; #3: Construction. 7. Billing fraud was more pervasive in these industries: #1 Religious, charitable, or social services #2: Construction, and #3: Manufacturing. 8. Lowest incidence of reported billing fraud in these industries: #1 Banking and financial services #2: Arts, entertainment, and recreation, and #3: Government and public administration. 9. Smaller businesses lost almost twice as much per fraud scheme. Organizations with fewer than 100 employees lost a median of $200,000 versus $104,000 for larger organizations with more than 100 employees. Travel and expense fraud was also more common in smaller organizations than larger ones (21% vs. %). This isn’t surprising since smaller organizations have fewer anti-fraud controls. On the other hand, larger companies may have more dishonest employees whose misdeeds can go undetected for months or years, according to the ACFE. 10. 24 months. That’s the average duration of both billing and expense reimbursement fraud schemes. Only payroll fraud goes on longer – an average of 30 months. This isn’t surprising since many organizations lack the detective monitoring tools they need to uncover T&E fraud. 11. Roles matter. T&E fraud schemes were most common among those in executive or upper management positions (29%), administrative support roles (22%), and finance (13%). Billing scams were most common among executives (35%), administrative support (33%) and accounting (29%). 12. Men vs. women. Overall, 69% of fraudsters were men. Losses caused by male fraudsters were larger ($156,000) than those racked up by females ($89,000). 13. The longer the tenure, the greater the losses. Fraudsters with more than five years on the job stole twice as much (a median of $200,000) than those with less time with their employers ($100,000). 14. Top red flags of fraud: #1: Living beyond their means #2: Financial difficulties #3: unusually close association with vendor/customers. 15. 85% of fraudsters exhibited at least one behavioral red flag. 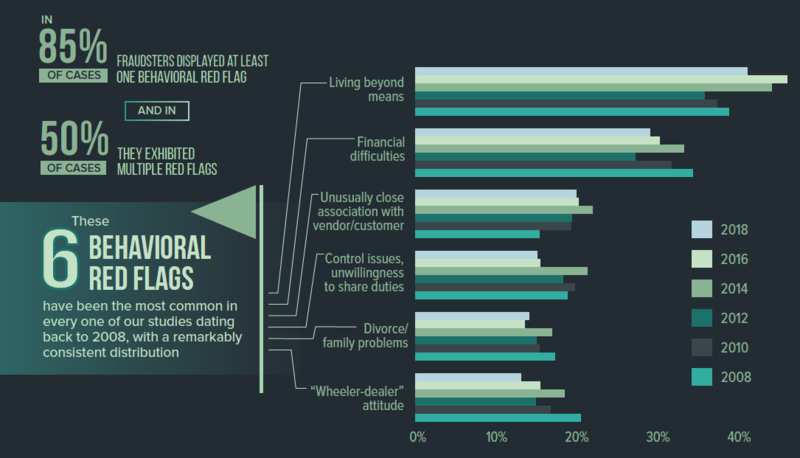 In 50% of cases, they exhibited more than one red flag. Unfortunately, workplace fraud and misuse will always be with us. But, as the ACFE study shows, organizations that implement strong financial controls, such as proactive data monitoring and analytics, can significantly improve the odds of detecting fraudsters while minimizing cash leakage. Demo Oversight to see how continuous data monitoring and risk mitigation can help you fight fraud in your corporate spending programs, such as travel and expense, purchase card, and procure-to-pay.